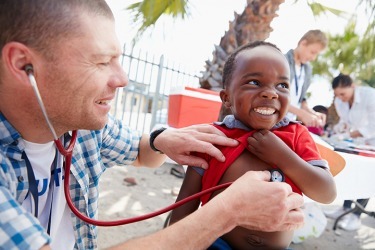 The doctors volunteer to provide medical care to needy families. Provide is defined as to supply or make available. An example of provide is to give a needy family enough food for a week. "provide." YourDictionary, n.d. Web. 20 April 2019. <https://www.yourdictionary.com/PROVIDE>. To have as an available or desirable feature; afford: a room that provides ample sunlight through French windows. To set down as a stipulation or requirement: an agreement that provides deadlines for completion of the work. Archaic To make ready ahead of time; prepare. To take measures in preparation: provided for the common defense of the states in time of war. To supply means of subsistence: She provides for her family by working in a hospital. To make a stipulation or requirement: The Constitution provides for a bicameral legislature. Middle English providen from Latin prōvidēre to provide for prō- forward ; see pro- 1. vidēre to see ; see weid- in Indo-European roots. Borrowing from Latin prÅvideÅ ("I foresee, I act with foresight"). Fred's lady friends will provide all the support I need. Alex was doing everything in his power to provide her with all the experiences of a natural mother. Our order should provide means to that end. She deserves more—much more, and I truly believe we could provide it.